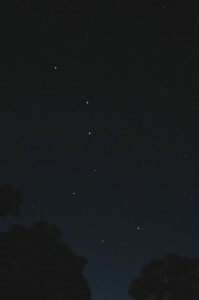 The Big Dipper can be used to find other, less prominent stars, most significantly the Pole Star. To find the Pole Star from the Big Dipper, imagine a line drawn between the two stars at the end of the bowl farthest from the handle. Extend that line away from the bowl about five times its original length and there is the Pole Star. Having found the Pole Star, you will also have found the last star in the handle of the Little Dipper. By imagining an arc coming off the end of the Big Dipper’s handle, you can find Arcturus.